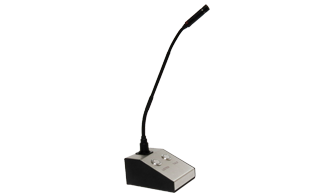 The PRO-ODM is an Operator Desk Microphone which includes a powder coated metal base and 2 Lighted Push Button Switches. With its pre-wired cord it is perfect for those locations where some user control is required. The Amber switch is typically used to mute and un-mute the ceiling speaker (labeled “Listen”) and the Blue switch is typically used to mute and un-mute the microphone (labeled “Talk”). The PRO-ODM includes a wide-range condenser microphone with a cardioid (unidirectional) polar pattern. It was designed for high-quality sound reinforcement and other demanding sound pickup situations. Standing 12.40” above the mounting surface, its small-diameter alternating gooseneck design permits highly flexible positioning while maintaining a smooth, well-contoured appearance. The microphone element is enclosed in a rugged housing with low-reflectance black finish. The PRO-ODM features a 3 pin XLR connector for easy removal of the microphone if desired. The XLR connector includes a permanently-attached twisted/shielded cable with tinned bare lead wire connections. The unit’s integral electronics is powered from DC power source in the Tech Works amplifier. The base is constructed of 12 gauge CRS with a textured black powder coat finish. The face of the desk console is 16 gauge brushed stainless steel with laser etched labeling. The buttons are lighted and hermetically sealed against moisture and vandal resistant. The gooseneck microphone shall be Tech Works PRO ODM with powder coated metal base, laser etched stainless steel face, and Lighted Control Switches.